Favorite Movie Scene of the Day #19! At least a dozen times per day, we all internally think the same sentiment. Those of us who are more courageous might speak it out loud. “I’m surrounded by fools.” Yes, we all think or scream this many times a day, whether we’re at the office, at home, out at a restaurant, or even watching the latest ‘Batman‘ movie at your local theater. Sure, we’ve replaced “fools” with other colorful words, such as morons, idiots, and even the occasional dingbat reference. It’s a thought that we all have shared more often than not throughout our daily lives that has become a universal joke over the decades. They’ve even made tons of merchandise, including keychains, bumper stickers, and T-shirts with this phrase on it. It’s like the universal wink to one another as we pass each other by in the hallways or on the streets. The other phrase we usually hear is “I’m surrounded by assholes”, which is more relevant today than ever. 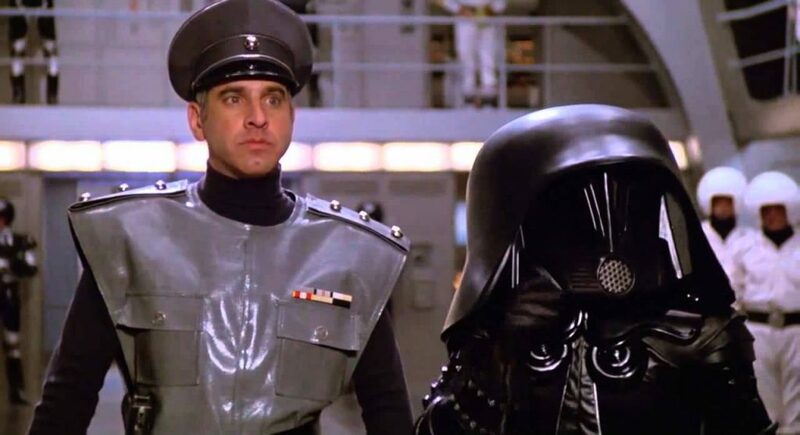 This old school joke that has been around for many years was perhaps best shown in Mel Brooks‘ film ‘Spaceballs‘, which is the Favorite Scene of the Day. You could technically put the entire ‘Spaceballs‘ film into The Favorite Scene of the Day, because each scene is nothing short of amazing, but this “I’m surrounded by assholes” scene is just as brilliant as they come. The scene basically starts out with Spaceball 1 firing upon the Mercedes Benz ship where Princess Vespa and her droid Dot Matrix are flying through space, where the evil Dark Helmet has them in their tractor-beam. To intimidate them, the henchmen on the big ship start firing lasers at the smaller ship, which infuriates Dark Helmet, because he thinks they’ll kill the Princess before he gets the combination to Planet Druidia’s air-shield. This entry was posted on Monday, March 26th, 2018 at 5:18 pm	and is filed under Film, News. You can follow any responses to this entry through the RSS 2.0 feed. You can skip to the end and leave a response. Pinging is currently not allowed.